Eco-friendly product for such an affordable price to promote my business. Doesn't get much easier to promote than this way. Loved the color variety of eco-friendly recycled pens I was able to order from. Thank you so much CEP. Ordered 8,000 of these for my convention and they worked out great. I've been ordering from Custom Earth Promos ever since. This company has never failed to complete my order in the most efficient way possible. My logo always comes out perfect on these pens and all products previously ordered from this company. Thanks again CEP! Its nice knowing that an pen can be bio-degradable. We can gain plenty of exposure and be eco-friendly at the same time. Inexpensive way to market our business. It's nice to be able to purchase a product that is made fully out of recycled material. We wanted to stay under budget, but needed a quality product to help our promotional value. Finding these eco-friendly pens was exactly what we were looking for. These eco-friendly pens were an outstanding way for us to advertise. We gave them to all our employees and had them hand them out where ever they went. You cant lose when marketing yourself and using pens to do so. They are easy to pass out, and with your brand printed on them its convenient. The materials used in the construction of these pens is really re assuring. I always like to support any company that provides eco-friendly products. A wonderful way for us to "go green" and promoter ourselves in a cost effective manner. Our pens look great with our brand printed on them. Affordable way to promote our brand and stay within budget. I ordered 5,000 of the eco-pens to pass out at all our events. Save big on your advertising budget with our biodegradable ballpoint pens offered at affordable prices! 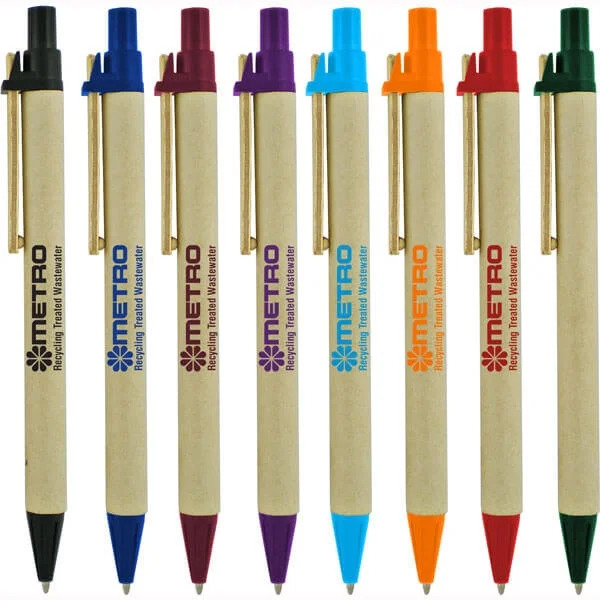 Manufactured from recycled materials, our eco-friendly pens are the ideal platform to promote your brand. Show your marketing audience that you uphold an ulterior motive that supports the ‘go-green’ movement by customizing your own bulk of Eco-Friendly Custom Recycled Pens. Scoring high on the usability and eco-awareness charts, our stylish ballpoint pens will proudly represent your brand name at your next upcoming event. Embed your logo or design on the visible imprinting area and watch the consumers gravitate to your business as you distribute them at your promotional campaign. With compostable recyclable qualities, constructed by earth-friendly materials, your customized ballpoint pens are bound to leave their promotional mark on your future clientele! Our sleek biodegradable pens reserve a 1 7/8” x ¾” imprinting region across their frame for your promotional needs. At Custom Earth Promos, we offer samples on request, free of charge, for you to approve prior to the shipment of your bulk order. Each pen is offered in four color accents, including green, blue, red and black, which are all set against a neutral backdrop to amplify your logo visibility. The eco-friendly manufacture of the pens will draw positive attention to your brand as it suggests to consumers that you are consciously contributing to the preservation of our earth. It will set you aside from competitor companies who offer poor quality promotional products lacking the eco-friendly aspect. Our biodegradable pens will naturally steer consumer attention towards your brand, ultimately carving the path to your business success! Once we receive your finalized artwork you wish you imprint on the pens, your bulk order will be shipped to you between 10-15 days. Our short production period allows you to obtain your large batch of promotional pens at a quick rate for near-upcoming events. If you prefer to have a small or large shipment sent to you, we offer various bulk amounts. We have design experts on staff who would love the opportunity to help you customize your pens to essentially be the perfect promotional product to advertise your business at your next trade show!